Physical and chemical properties of UF6, and its use in uranium processing. Uranium hexafluoride is a chemical compound consisting of one atom of uranium combined with six atoms of fluorine. It is the chemical form of uranium that is used during the uranium enrichment process. Within a reasonable range of temperature and pressure, it can be a solid, liquid, or gas. Solid UF6 is a white, dense, crystalline material that resembles rock salt. 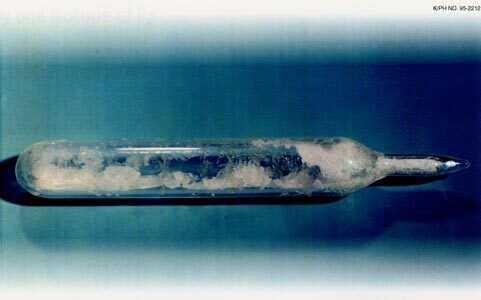 UF6 crystals in a glass vial. Uranium hexafluoride does not react with oxygen, nitrogen, carbon dioxide, or dry air, but it does react with water or water vapor. For this reason, UF6 is always handled in leak tight containers and processing equipment. When UF6 comes into contact with water, such as water vapor in the air, the UF6 and water react, forming corrosive hydrogen fluoride (HF) and a uranium-fluoride compound called uranyl fluoride (UO2F2). The gaseous diffusion process used to enrich uranium requires uranium in the form of UF6. In the first step of UF6 production, uranium ore is mined and sent to a mill where uranium oxide (often called "yellowcake") is produced. The uranium oxide is then sent to a UF6 production facility. At the production facility, the uranium oxide is combined with anhydrous HF and fluorine gas in a series of chemical reactions to form the chemical compound UF6. The product UF6 is placed into steel cylinders and shipped as a solid to a gaseous diffusion plant for enrichment. Uranium hexafluoride is used in uranium processing because its unique properties make it very convenient. It can conveniently be used as a gas for processing, as a liquid for filling or emptying containers or equipment, and as a solid for storage, all at temperatures and pressures commonly used in industrial processes. For more information on uranium processing, see the Depleted UF6 Production and Handling slide show and Uranium Enrichment.